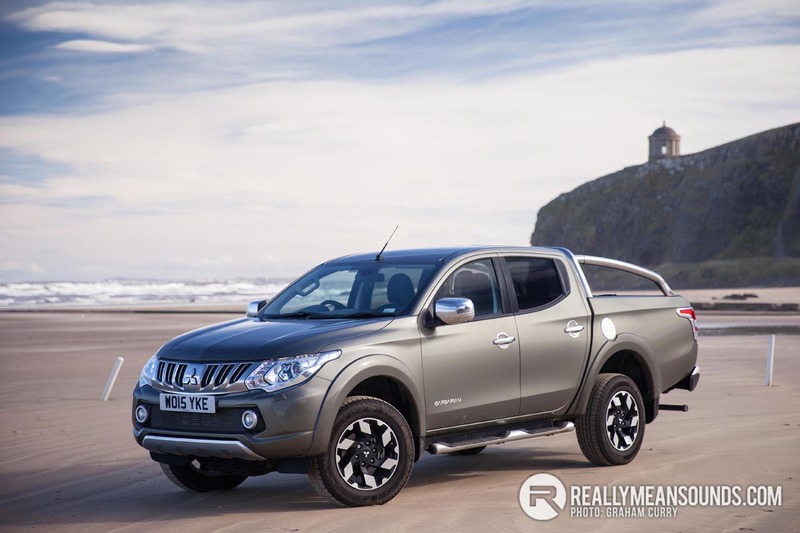 Mitsubishi have been a driving force for years in most segments of the car market and in particular a firm favorite within the commercial sector for a very long time with their L200 pick-up which seemed to be very popular with landscape gardeners and farmers alike. 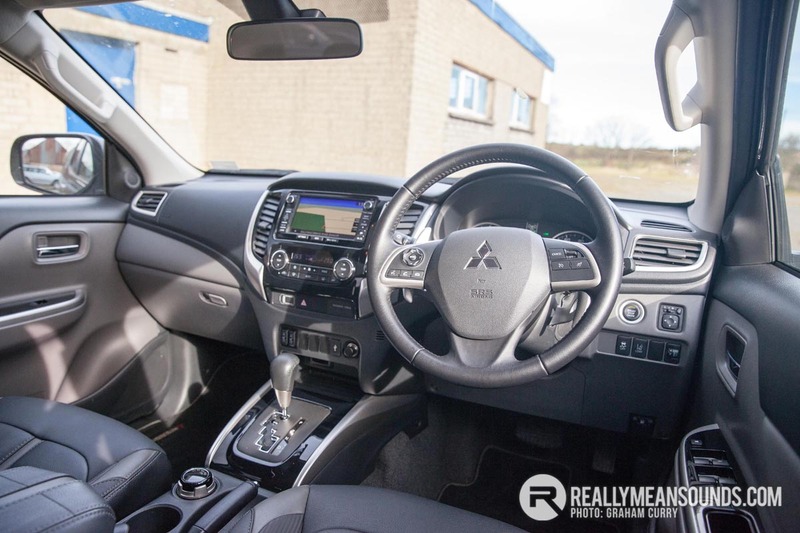 Recently Mitsubishi launched the Series 5 L200 and over a few hundred miles we got to grips with this all new model, most of which was around the tremendous North Coast on challenging roads, beaches and indeed some of the worst storms we have seen this year. This latest L200 has much cleaner lines than before giving it a smoother look with its new curves and visually it has quite a road presence while this Barbarian model is fitted with a chrome rear roll hoop and side steps. The colour of this test model is Amazon Green and when people mention green for a vehicle I would normally screw my face up in anticipated disgust however this colour from Mitsubishi is in fact incredible looking in reality, especially when the sun glints off its metallic glow. A trend that I am seeing with a lot of manufacturers at present is that the front and rear lights are tending to wrap around the body into the wing and quarter panel alike and the L200 is no different in that regard and is equipped with front DRL’s. 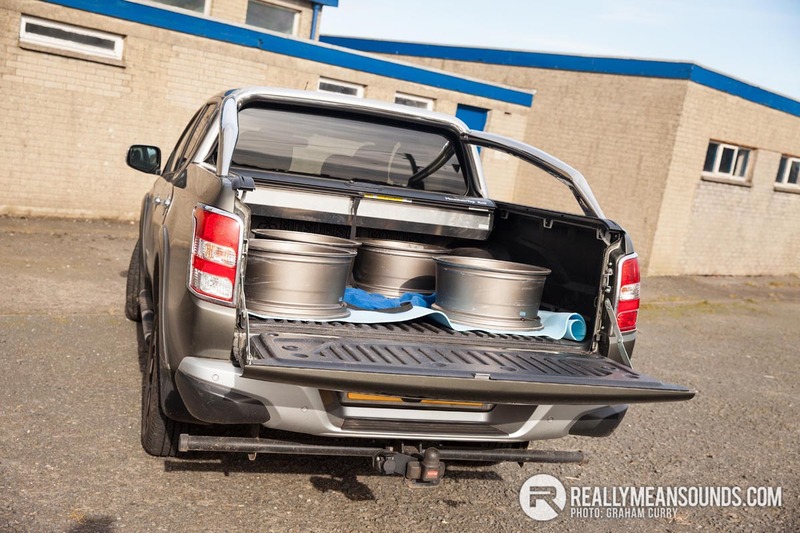 Rear loading space is very usable with a payload of just over 1 ton. This test vehicle was equipped with a roller top cover on the loading bay which was great for safety and once I got used to the fiddly locking mechanism proved helpful when I collected a set of wheels and needed to keep them secure for an hour whilst at the shops. Towing weight is one of the biggest sellers with pick-up vehicles and the L200 falls short of class winners the Ford Ranger & Isuzu D-Max that are capable of 3.5 Ton with just 3.1 Ton capacity for the Mitsubishi. When compared to others in the sector such as the Great Wall Steed though, this is still very respectable. The Series 5 L200 is only available as a double-cab thus all coming with five seats, four doors and inside the previous L200 was never a great place to be, it was cramped and uncomfortable with cheap materials everywhere and things have changed for the better with the Series 5 L200. The model tested was fitted with full leather interior with the front seats being heated and indeed were surprisingly comfortable. The driving position has improved a lot and with the front seats in a position comfortable for an adult on a long drive there is still plenty of leg room in the rear for adults. 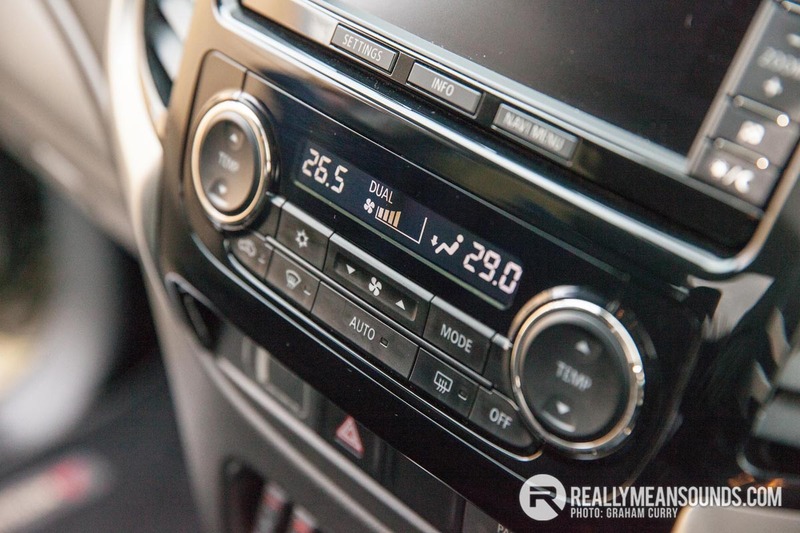 Materials used and switchgear on the dash are still a little utilitarian and dated with some parts of the car reviewed broken on collection of the vehicle. Keyless entry means there is a start/stop button in the dash and above the digital climate control panel is a large touch screen infotainment system that over the week I had the L200 wasn’t overly user friendly and no matter what I tried could not pair my Android phone to the system. None the less it had useable sat nav, DAB radio and a very useful reverse camera. Engine wise the new L200 is equipped with a 2.4L turbo diesel engine producing 178bhp with a fantastic 317lb/ft of torque and on this test model was paired to the four wheel drive system via a five speed automatic gearbox, which provided plenty of grunt and smooth enough power, however the engine was noisy at speed and the ‘box a little sluggish. Steering lock is something that a lot of pick-ups struggle with and the L200 was never agile around town and this Series 5 is no different, what would be a simple 3 point turn in many vehicles becomes a little clumsy and time consuming in this compared to the likes of the Isuzu D-Max which has car like steering agility. 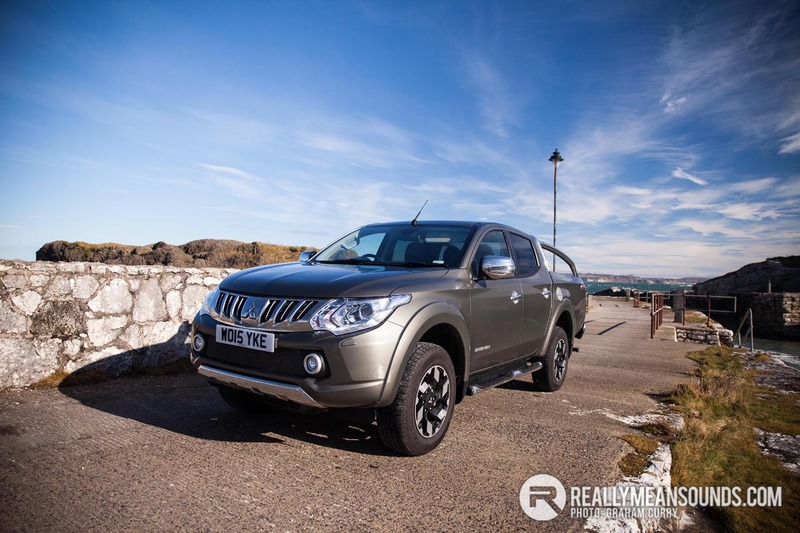 Driving the L200 on the road felt safe, I can only assume it has a much stiffer chassis to its competitors and as such has very nice handling mannerisms which may be aided by the larger 17 inch alloy wheels on this car we reviewed. Due to this I can imagine the off-road capability of the L200 would be very strong indeed and with variable differential settings switchable on the move, I don’t think much would stand in its way. Servicing of the Series 5 L200 is due annually or at just over 12,000 miles with road tax more than affordable at just £225/annum. Warranty cover lasts for 5 years or 62,500 miles which maybe isn’t ideal for those doing large miles and pricing for the model tested with extras was around the £30k mark. Overall I think the L200 has improved greatly and since reviewing this model I have since driven the previous model which reminded me as to just how nice this latest version is to actually drive in general however from my experience, as an all rounder I still believe the Isuzu D-Max is hard to beat.